I've encountered what I suspect is a rendering bug when viewing Portals (linedef 156) through a sector that has a Fade (fog) effect applied via the "outsidefog" MAPINFO variable. It looks as though the outsidefog Fade effect isn't applied pixels that make up the Portal. So no matter how far away you are from the Portal it is never obscured by the fog. 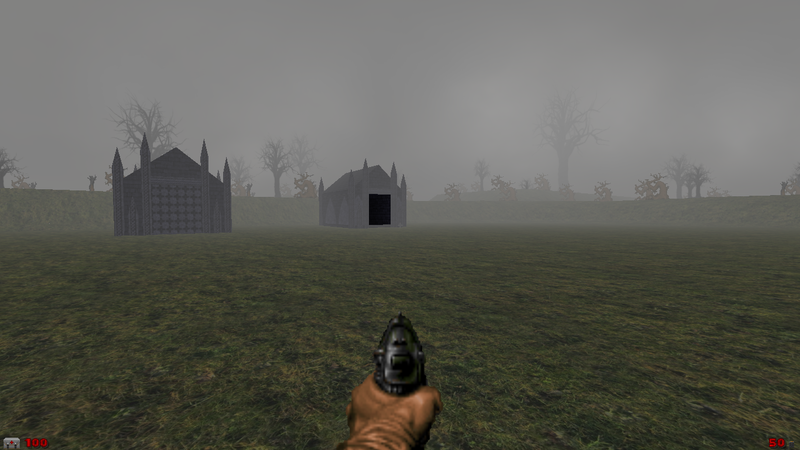 This is using GZDoom 2.2.0. Attached is an example wad I just threw together to demonstrate the effect. Note: This doesn't apply to sectors that have their fog set manually, only to sectors affected by the outsidefog MAPINFO variable. Fixed to the most reasonable degree possible. What cannot be done is drawing fog boundaries on portals on one-sided lines. These are discouraged anyway. It is also necessary to give the filler sector behind the portal a non-sky texture. This is because on lines where both sides are sky no fog boundaries are drawn and this code has no access to the portal information. As a work around, I have discovered if you apply action 87 (use outside fog) to even just a small sector immediately on the other side of the portal (the non-outside side) it renders correctly from all angles.